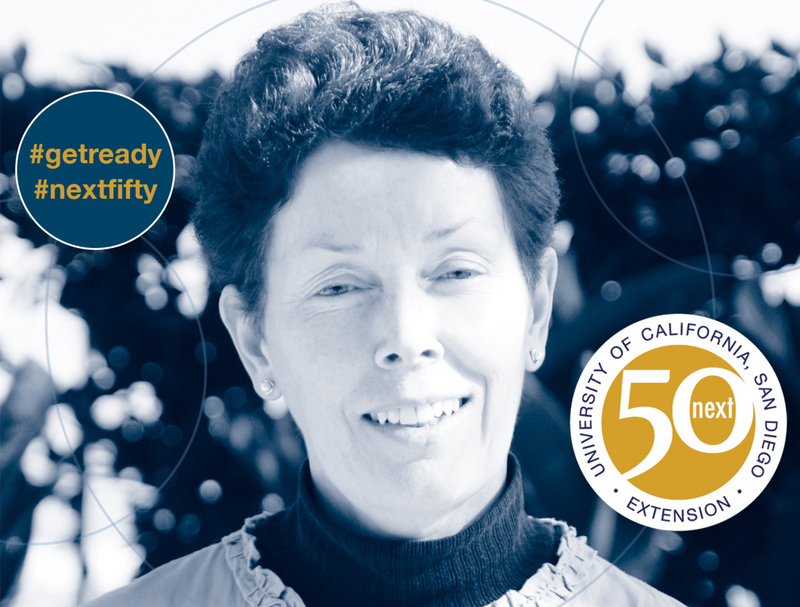 In honor of UC San Diego Extension’s first 50 years, 50 Voices of the Future asks thought leaders about the trends, breakthroughs and social advances they foresee over the next 50 years. As Carl Sagan once said, “We live in a society exquisitely dependent on science and technology in which no one knows anything about science and technology.” Tam O’Shaughnessy, co-founder of Sally Ride Science and executive director of Sally Ride Science at UC San Diego, has worked for years to remedy that situation. As a career scientist and educator, she emphasizes the need to empower all students—especially girls and young women—to become scientifically literate and to master skills in science, technology, engineering and math (STEM). (1) Why is the work you do important? The work of Sally Ride Science at UC San Diego is important because our society depends on STEM. We need to make sure all students are literate in STEM so they can make informed decisions about their lives—their health, their communities and our planet. Eighty percent of the fastest growing jobs in America require knowledge and skills in math and science. Our future engineers, software developers and data scientists need STEM skills, yet the workforce in these crucial jobs does not reflect who we are in America. Even though women make up 50 percent of the U.S. workforce, only 28 percent are employed in STEM fields. Historically underrepresented groups—Hispanics, African Americans, American Indians and Alaskan Natives—make up 26 percent of the U.S. adult population, but they account for only 10 percent of the workers in STEM jobs. Science advances and grows when people from all parts of our society contribute. We face huge challenges—where will we get enough sustainable energy? How will we curb emissions of greenhouse gases? How can we contain disease epidemics? The solutions will come from science. We need to make sure we are tapping into the talents and creativity of women and men from all backgrounds to overcome those obstacles. (2) What are the influential/exciting developments happening in your field now and why? STEM is at the forefront of the education policy discussion these days. Educators, parents, lawmakers and corporate America understand the need for a STEM-literate citizenry, and they are taking steps toward that goal. There is a critical mass of people building on what research and classroom experience show works best in STEM education. This includes improving teacher preparation and establishing consistent standards and curricula across states. When we achieve excellence in science classrooms, teaching and learning are dynamic. Students work cooperatively to share ideas and participate in discussions. They make predictions and talk through explanations, evidence and relationships between hypotheses and data. Students review and evaluate their own knowledge and revise their ideas based on new information. In an excellent science classroom, students are immersed in doing science as it is done by real scientists. (3) What’s the next big thing? The next big things are equity and excellence—in STEM education and, in turn, in STEM fields. Our society will reap countless benefits if we enable all students to be their authentic selves. We need to provide excellent educational opportunities for everyone regardless of gender, race, cultural or ethnic background, disabilities, gender identity, or sexual orientation. (4) How big an impact will your field play in shaping the future of the San Diego region and beyond? Making sure that all students receive an excellent STEM education will play an enormous role in shaping the future of San Diego and the nation. Equity and excellence in STEM education will impact everything from productivity and prosperity to innovation and quality of life. STEM literacy empowers people to make informed decisions in their personal lives—selecting nutritious foods, evaluating options for medical treatment or adopting environmentally responsible habits. STEM literacy also enables people to weigh competing arguments and reach valid conclusions on issues facing our society. An understanding of basic STEM concepts prepares young people for the future by developing critical thinking skills that are invaluable in any field of study and in any career. Not all students want to pursue advanced degrees. There are opportunities in STEM for everyone. For example, half of all STEM jobs don’t require a four-year degree. These jobs pay an average of $53,000, which is 10 percent higher than non-STEM jobs with similar education requirements. (5) Hop into your time machine…what does the future look like for this field in 50 years? How can individuals/companies get prepared for what’s next? Fifty years from now, equity and excellence in STEM education will be realized. This is a lofty view of the future, but based on the progress we are making, we can achieve this goal. When we create a STEM-literate citizenry—and all that it entails—our country will be stronger socially and economically. Individuals, nonprofit organizations and companies can help realize this future by supporting their communities’ efforts to improve STEM education based on our current knowledge of how children and adults learn. We invite you to more about Sally Ride Science at UC San Diego and other Pre-College programs that we offer at UC San Diego Extension.